LAMB’s mission is to create a self-directed learning environment in which children build a foundation of knowledge essential for a life time of learning while developing bi-literacy in English and Spanish. The school operates from two sites – the historic Military Road School in NW (Ward 4) and our Perry Street location in NE (Ward 5). The school serves 426 students from pre-school through 5th grade. LAMB’s reach goes far beyond the four-walls of the school with students and families coming from all eight wards across the District of Columbia. While Montessori, in and of itself, is a unique educational model, the Latin American Montessori Bilingual (LAMB) Public Charter School pairs it with second language development and inspires children to learn as part of a natural process of their development. Dual language (Spanish/English) immersion program to children beginning at 3 or 4 years of age with the goal of fluency in both languages by 5th grade. Walk into any LAMB Montessori classroom, and you will invariably see happy and busy children working purposefully. The learning environment has been equipped with child-sized tables, chairs, and materials that are supportive of the child’s natural learning. Teachers at LAMB have been trained to “Follow the Child,” i.e. an acknowledgment that the child has his or her own pattern that we need to take into account where the child is at, rather than impose our idea of what the child should learn at a particular moment. LAMB’s Montessori curriculum is aligned with the Common Core State Standards, adopted by the District of Columbia in 2010. LAMB implements the Montessori Cosmic Curriculum, an integrated body of lessons designed to sow the seeds of all future learning by exposing children to history, geography, anthropology, biology, chemistry, physics, astronomy, botany, and ecology through a series of integrated Great Lessons. Targeted professional development for teachers maps the most up to date scientific research that supports early childhood learning. LAMB has an active PTO which raises funds throughout the year to support various school programs. LAMB has a fully developed bilingual special education department and serves students with special needs in the general education classroom through the support of inclusion teachers and special service providers. Since its inception LAMB has supported environmental sustainability and related projects. LAMB has an arts education program with both visual arts and music, as well as an after school dance program. 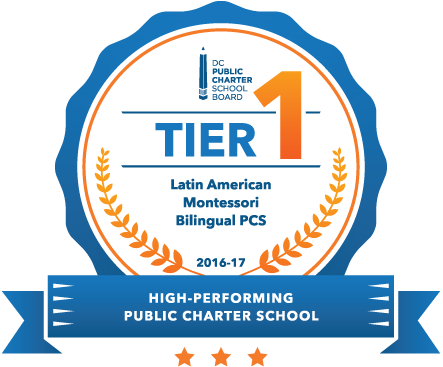 Each classroom has two instructors, one who teaches a half-day in Spanish and another who teaches a half day in English, utilizing Montessori curriculum aligned to the D. C. Standards. For the past eight years, LAMB’s waiting list has been equal to and/or vastly exceeded its total enrollment. LAMB is a member school of DC International School (DCI), an International Baccalaureate middle and high school which opened in 2014. LAMB’s mission is to create a self-directed learning environment in which children build a foundation of knowledge essential for a life time of learning while developing bi-literacy in English and Spanish. The school operates from three sites – the historic Military Road School in NW (Ward 4), Perry Street location in NE (Ward 5), and our newest location at the Walter Reed campus in NW (Ward 4). The school serves students from pre-school through 5th grade. LAMB’s reach goes far beyond the four-walls of the school with students and families coming from all eight wards across the District of Columbia.